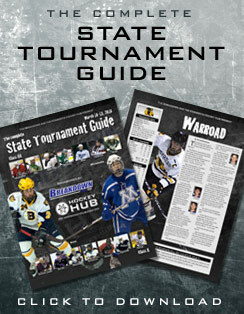 The memory of last year’s Class A state title game loss to Breck still stings up in Warroad. The Warriors, searching for their fifth state championship, matched up with Breck in a classic showdown that typified the best of the state tournament. Public versus private. Outstate versus metro. Country versus city. Warroad arguably controlled play for more of the game, outshooting the Mustangs 36-24. But it was Breck that carried the trophy around the X at the final horn, winning 7-3. John Russell shone in nets, stopping 33 shots and eliciting chants of “MVP!” from his home crowd. While Breck seemed an easy pick to get back to state, returning 20 letter winners, Warroad’s path was much less certain. The Warriors graduated many top players, including goaltender Jason Goldsmith, leaving plenty of holes. But the fire from that loss to Breck still burned in the remaining Warriors, including All-Staters Brock Nelson (47-38-85), Brett Hebel (26-44-70) and defenseman Carson Gray (7-33-40). Section 8A championship game last Thursday night. But that only got them to St. Paul. “Your next job is to win the state title and that’s what we go down there for,” Hasbargen said. 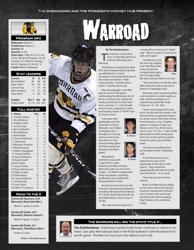 Warroad’s path may have gotten a bit smoother in recent weeks, as well, with the emergence of sophomore goaltender Andy Foster (8-1-0, 1.95, .901). Foster wasn’t expected to see much varsity time this winter, with Shawn Storey carrying the load in his senior season. But when Storey hurt his knee in a Jan. 26 game against Crookston, Foster was thrown in the fire. All he’s done since is win 10 of his 11 starts while allowing more than three goals just once. In the past four games, Foster has given up just three goals. “He’s done everything that we’ve asked of him,” Hasbargen said. As the Warriors know, it’s important to have a hot goaltender at this time of the season. They remember peppering Russell with shot after shot last March -- to no avail. on the same side of the bracket, however, meaning the rematch won’t come in the state finals.